Join the artist for a free opening reception! Talk and demonstration will begin at 7 PM. I like to make things that other people think are “cool”. I like other people to make things that I think are “cool”. 1. The piece must produce sound. 2. The piece must function as visual art. 3. The piece must be made primarily from recycled materials. 4. The piece must be made utilizing relatively low-tech techniques. There is something about good art that strives to transcend categories that are later imposed on it. I value integrity and originality, in my work, and in the work of others. Larnie Fox is a visual and sound artist known for paintings, monumental bamboo sculpture, sound art, sound installations and performances. 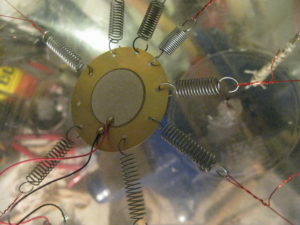 His kinetic/sound sculpture and paintings have been shown in one-person shows at The Lab, The Richmond Art Center and The Randall Museum, and in numerous group shows and performances. 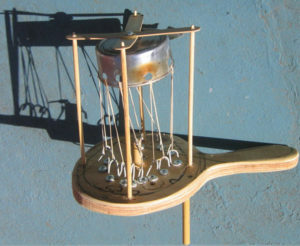 He directs the Crank Ensemble, a fourteen-member group that performs on hand-cranked instruments built by Larnie. He was commissioned to create and burn a 20 ft. bamboo and muslin windmill at Burning Man, and there he made and flew a bamboo airplane with his wife Bodil. Other collaborations with Bodil have included set design and construction for Theatre of Yugen’s “Cycle Plays” at Theatre Artaud (now Z Space), a giant kinetic dragonfly for the DuPage Museum near Chicago, and “Time Sensitive Materials” at Cricket Engine in Oakland, CA. Fox is also an arts consultant currently representing the Estate of the painter Jon Schueler. He formerly was Executive Director of Arts Benicia and Director of the Children’s Fine Art Program for the City of Palo Alto at the Palo Alto Art Center. He has taught drawing, art appreciation and color design at Weber State College, Ogden, Utah, and drawing at the Community University in Bozeman, Montana. He is a founding member of 23five, a Bay Area non-profit that promotes sound art. He holds an M.F.A. 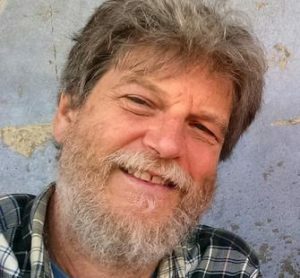 in Painting and Drawing from the University of Utah, and a BA in Painting and Drawing from Slippery Rock University, Pennsylvania, and lives, works and collaborates with his wife Bodil in Benicia, CA. He and Bodil are past resident artists at the Montalvo Art Center’s Lucas Artists Residency Program in Saratoga, CA.